In Part 1, I talked about growing readers, reading aloud, and chapter reading. I talked about how language, and the number of words a child hears is critical to academic success in school. And I took language to the next step, expanding on a picture book and writing what children saw and thought. By fourth grade only 54% read something for pleasure every day. By eighth grade only 30% read for pleasure. By twelfth grade that number has dropped to 19%. The key word is pleasure. Reading aloud = academic success + pleasure. I was a new teacher then, yet I just knew this was true. Teachers can tell. I jumped into reading aloud with both feet, and I quickly saw the results. Statistics talk, and I was a witness. That’s the backstory. 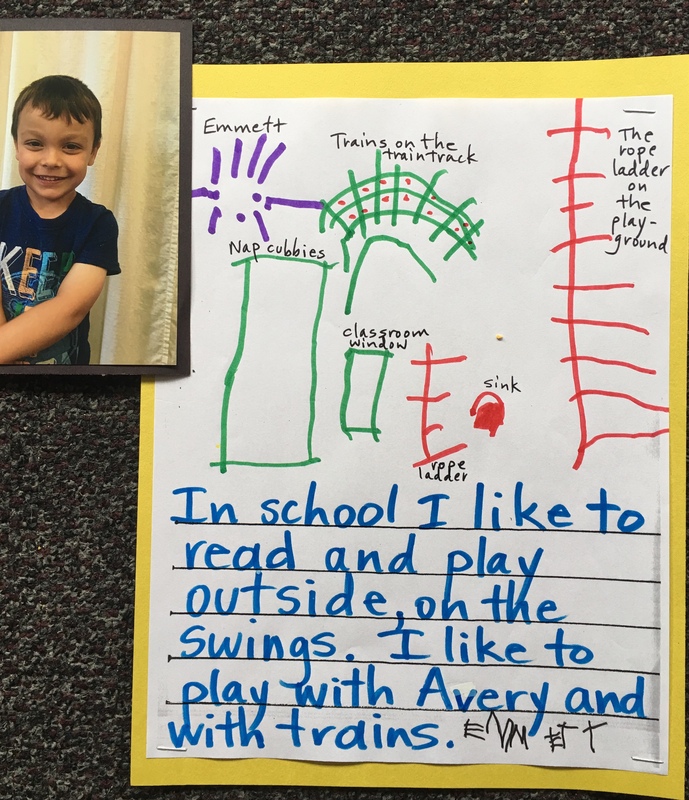 In order for children to climb that ladder and take language to the next step, my first project of the school year is writing picture stories with the children. 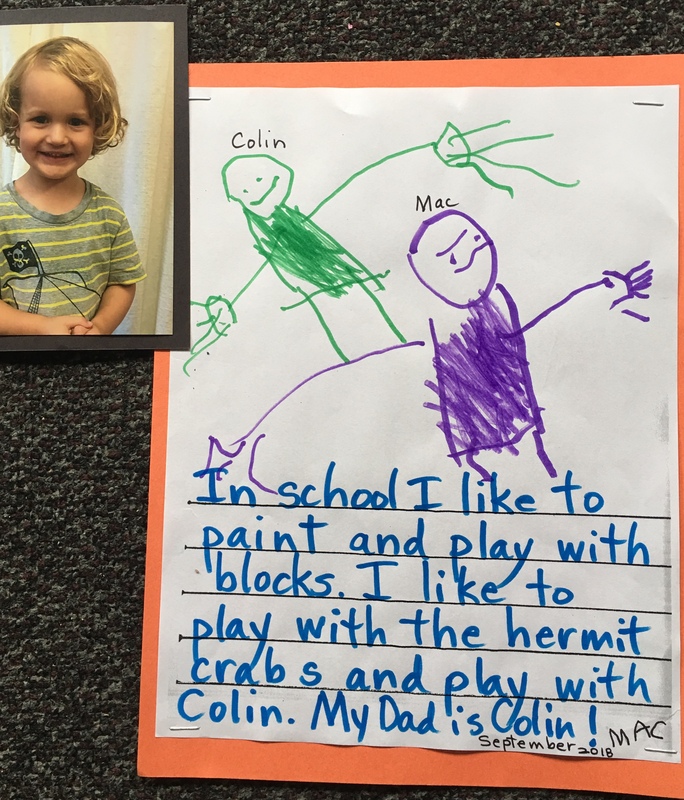 In late September I ask each child what they like to do in school. This is not a casual question. It’s the first time their teacher has asked it, one-on-one. First, they have to think. I can almost visualize a fast-forward movie playing in their brains. With no other prompting or questions, I get “the story”. Each child watches as I write his / her exact works. I have not only put their thought into a written image, I have validated that what they say is important. Because it is. Next, each child draws a picture of their story. I mount the story along with their photo and hang it in the hallway. Of course we have a field trip to the hallway to read aloud everyone’s picture story. Language is critical to learning in all academic areas, so its only natural that creating picture stories is an excellent tool for teachers. Its a fun activity for children, because they want to tell you a story. Yet, children really have to think in order to do this. They must pull words from their heads to tell a story. When we write stories, or picture stories, it gives children the opportunity to use all those wonderful words they have heard, over and over again, through our picture books and chapter reading. Now, it is their turn. Instead of listening and learning, they are taking their own experiences, using what they have learned through reading, and making stories. That is why their stories are rich in vocabulary and text. Writing stories also increases social skills, language skills… and confidence. This entry was posted in chapter reading, Early Education, picture stories, preschool, reading, reading aloud, reading aloud, storytelling, Teaching young children and tagged chapter reading, Early Education, language development, literacy, parent tips on reading to children, picture stories, preschool, reading aloud, reading books to children, writing picture stories. Bookmark the permalink. Oh Jennie, This is so incredible! It’s odd in a way because it should be basic knowledge, but it is not so, and I can understand the way teaching is done today why over the years children begin to stop reading AND writing. You are so amazing and I think you deserve a certificate of quality every single day you teach. You touch my heart with your most sincere caring for the children and seeing them so happy is even more touching. This will last their whole lifetimes. Thank you so much. Thank you so much, Anne! 🙂 I appreciate your kind words. What a great exercise, Jennie. Thank you for sharing. This is a marvellous idea! I always scribe what the children are telling me as they are drawing, and they love the idea that their spoken words, can actually make written ones. It’s like that concept isn’t there until you show them! Jennie – that’s the way to do it! We need more like you! Valuing children, opening their minds, encouraging creativity and instilling the fun of reading! Superb! these are amazing pieces. Incredible and brilliant. Long may your pen remain dipped in the ink-pot! I love these. Pictures are so great for storytelling. No worries about printing, losing train of thought, or anything like that. Just draw! More inspirational and wonderful stuff, Jennie. 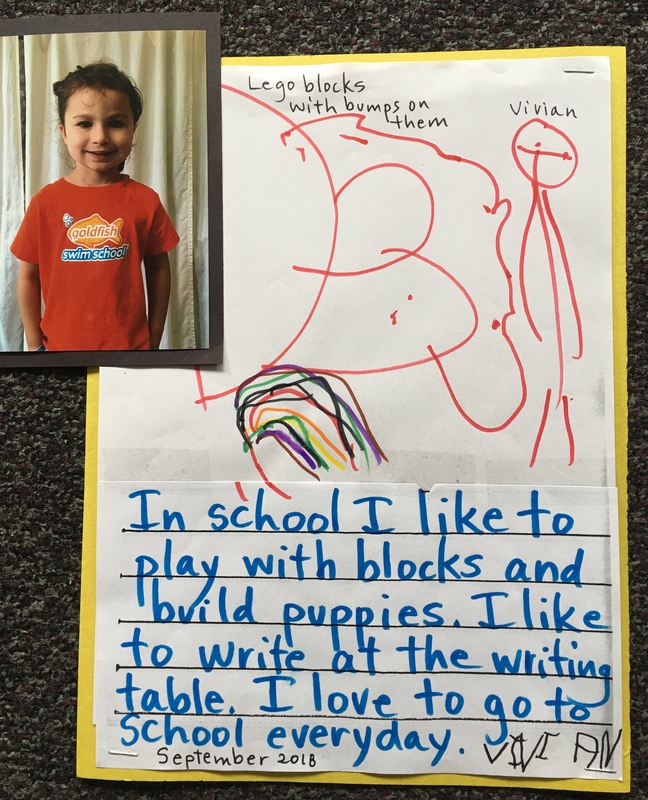 I love what each child wrote about school in those captions. Jennie, this is wonderful. By telling a d showing us what you do, you are teaching us the skills young people need for success. Those of us who interact with kids can use these lessons to our advantage. Thank you. You said it well, Steve. We do learn better that way. Best to you, and how is the crossing guard going? A month into school and I have a story to write about it, Jennie. At least I have a title, ‘Who Is Jeff Bezos…and Other Stuff Kids Know’, the story is still percolating. Meantime, I just posted my recent ‘Bar Chronicles’ story about a story. Hope you read it. All my best, Jennie. Oooo… you know, I will! Gosh, Jennie… Those are sad statistics. Actually, they’re downright disturbing. I don’t think most people would realize how severe it is. Thank you for sharing the information. People should know. Thank you for another lovely post. TGIF hugs! Now this is delightful and heart warming but I have one question, that is triggered by a debate that is rumbling around here and I’m sure in the US. 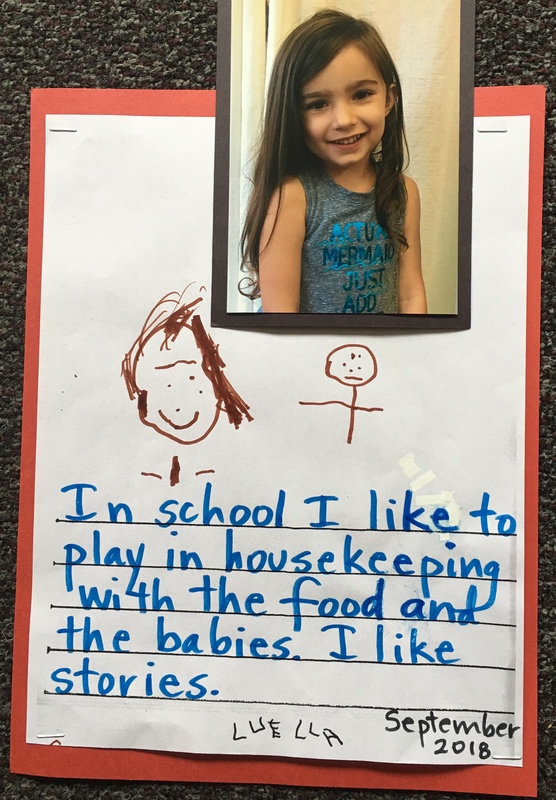 The last little girl’s words are about housekeeping and food and babies while the last little boy is about swings and trains. A lot of heat is being generated about sexual stereotyping of young children – boys = colour blue, football and science, girls = cooking and arts and pink. The indications are you can’t start too young in breaking those down but then again children will chose their likes and some go one way and some the other. Does this factor at all into what you’re doing here? It’s a new world to me, Jennie – both kids adult but, who knows, grand kids may appear and it’s as well to be prepared! This is part 2 in this excellent series on reading and children–by the wonderful teacher, Jennie. instead of finding the work a chore. I love to read their work. Well said, Miriam. Thanks so much! Lovely post, Jennie. I have found that reading does drop off a bit during the teenage years. I experienced that myself. Teenagers are trying to conform and socializing becomes very important. I have noticed that children that develop a love of reading always go back to it as adults even though it drops off a bit during the teenage years. Well said, Robbie. When the love of reading is established early on, it never goes away. We were always encouraged to read, and we always encouraged our daughter (although she didn’t need much encouragement). Reading remains a passion – and – a pleasure. You’re doing a very good thing for these children, Jennie. The impact of reading is so far reaching, once that pleasure is established. I’m glad that you were encouraged, and Faith too. Many thanks, Dan. I loved reading until about middle school when reading became work; It was more about breaking it down to last period; understanding each book structurally, psychologically, and critically rather than for pleasure. I hated reading then. There was so much homework, and the books were assigned or chosen from a required list. There wasn’t too much time left for reading for pleasure. Poetry kept me sane then. Little snippets of poetry and music. Once out of school I could and did begin to read for me and pleasure again. I saw that with my friends as well although most did better than I did with it. 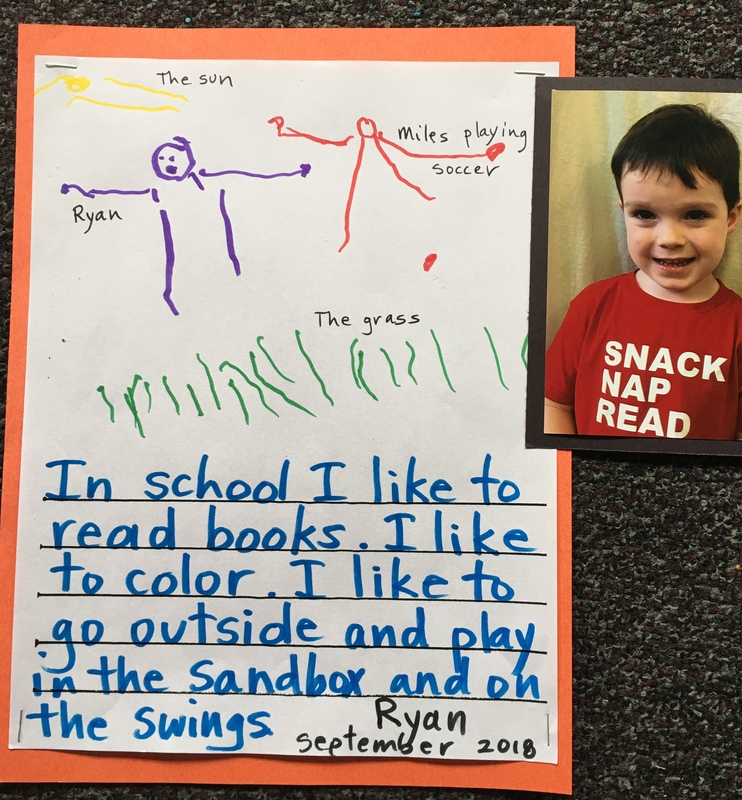 The reading log has came home to record #1 Grandson’s reading this week. So this journey begins. I hope he’s able to keep reading in his life forever, and though it may ebb and flow he always finds his way back to a good book for his own pleasure. My goodness, Sally. That is so nice. I have always felt that a collection of these stories in a book for teachers and parents is a good idea. Hoping that an agent feels the same way 🙂. Yes, we do remember those teachers, like Mrs. Milller. Thank goodness! Hugs to you! Many thanks, Michael. Best to you! This is wonderful, Jennie. I very much enjoyed reading each child’s story. It makes me long to be back in the classroom. Developing enthusiastic readers, writers and learners (it’s all inter-twined) is my first love. Writing their stories word-for-word as they dictate them is so important. It shows them the power of their words, that stories are words written down, that their words can be written down and read by others. It helps them unlock the mystery of print and share in the secret world of stories. Such joy! Wonderful ideas! So much inspiration! The statics though, they really make me sad. It’s the same thing over here. Thank you, Sarah. Those sad statistics just drive me to do something to make a change. And you do so brilliantly, Jennie!! Thank you, Nicholas! Now that you have a young child, I highly recommend The Read-Aloud Handbook.